I'm sure you've all been anxiously awaiting my final thoughts on last week's AHR Expo and, I apologize, but you're going to have to wait one more day. You see, after the show ended last week, my wife and I took a quick trip to see the Hoover Dam, as well as the Grand Canyon. We've both been to Las Vegas several times and, while not gamblers, have pretty much "been there, done that" when it comes to Sin City. Sure, it's a nice getaway (which is why she came with me in the first place), but there isn't much else for us to do after a few days. We thought about going to see a show, but then she suggested we rent a car and drive out to the Grand Canyon. It was a terrific idea! 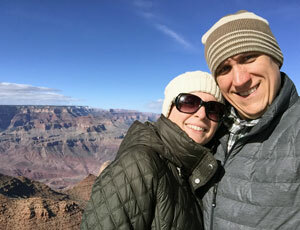 Neither of us had ever been to the Grand Canyon, and it was definitely on our bucket lists. So, last Thursday, we got up early to check out of our hotel in Las Vegas, rented a car and headed out. The first stop was Hoover Dam, which is less than an hour outside the city. It's a worthwhile trip the next time you're in Sin City and looking for something different to do. The tour was a bit more historical and educational than April would have liked, but we both enjoyed it nonetheless. The Hoover Dam is certainly a testament to human ingenuity and an amazing accomplishment, let alone for the time period in which it was constructed. After spending a couple of hours, we hit the road again and headed East. It was dark by the time we reached Tusayan, Ariz. We checked into our hotel and drove around the small village just south of Grand Canyon National Park before finalizing our game plan for the next day and getting some sleep. On Friday, we rose bright and early and immediately headed a couple miles north to the South Rim of the Grand Canyon. After stopping at the visitor's center, we quickly ducked into a gift shop for some warm hats (it's was only 30F and windy, after all). We spent the next several hours driving along the South Rim, stopping at each and every lookout to take pictures and enjoy the views. I cannot begin to explain just how awesome the Grand Canyon is — it's definitely something you have to see in person to truly get a feel for just how, well, grand it is. With a red eye flight that night, we headed back to Las Vegas. It wasn't a long trip, but we'd seen enough to satisfy our desire to visit this great wonder — and know that we will definitely be back for a longer trip (when it's warmer) that will include some hiking. If you've never been to the Grand Canyon, then I urge you to go if you ever have the chance. You will not regret it. I promise.